While the focus of much study represented in this publication has concentrated upon the activities of the English and Scottish armies in England between the 22nd August and 9th September 1513, very little is known about how the extensive Scottish force, its artillery train and camp followers travelled through the Scottish Borders, what route it took and where it camped. Indeed, prior to the current investigations initiated through the Flodden 500 Project, all that was known with any degree of certainty was that James IV of Scotland departed Edinburgh on 17th August 1513 and crossed the English Border on 22nd August 1513. In order to elucidate these questions, David Caldwell (this publication) has reported on his extensive documentary research into size, character and make-up of the Scottish fighting force and what can be deduced about the routes it took to the English border. While much remains in doubt, he has arrived at a number of conclusions based upon direct and comparative evidence, some of which merit additional work to test and authenticate them. 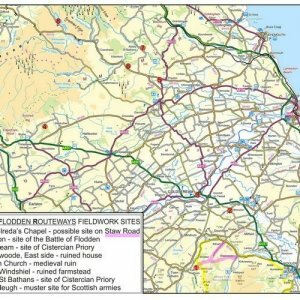 The current paper, therefore, reports on additional fieldwork and map-based research carried out in order to finesse and extend the results of the documentary research on the likely routes taken by James IV and his army to Flodden. One of the principal conclusions of the documentary work is that the assembling of the Scottish army at Flodden involved contingents meeting at several different muster points and traversing several different routes before meeting up at Ellem and heading across the English Border. Several of the main roads that were in use in 1513 are known, but there is still work to be done in understanding the nature of these roads. As a result of this study it is possible to identify several sites, river crossings and roads that are particularly deserving of archaeological examination. were constructed of perishable materials and do not survive, but excavated remains suggest that most were single storey with stock lodged at one end. As late as the 1790s shepherds’ cottages in Roxburghshire were described as ‘miserable, temporary hovels’ with walls of stone and turf, roofs of turf and rushes with wicker–framed clay chimneys suspended over open hearths (Cruft et. al. 2006, 83). Consideration of the above led to a number of sites thought likely to have been used by the Scottish army, whether because they were mentioned in contemporary documents or are thought to have existed as structures in the early 16th century, to be chosen for further investigation. This included the survey and trial excavation of Windy Windshiel, a multi-phase farmstead high on the north flank of the Whiteadder Valley, previously investigated by Flodden volunteer Barry Prater, while the ruins of a house near Spottiswoode were also investigated to ascertain their date. A limited programme of survey and excavation at the remains of Windy Windshiel farmstead, 1 km south-east of Ellem, was carried out in May 2016 in order to further the work of project volunteer, Barry Prater and attempt to determine any links with the early 16th century, specifically, given its position on a routeway taken by James IV’s army from the muster point at Ellem, any connections with James IV’s Flodden campaign. The results of this work are included in a report on Ellem (this publication). An investigation was made of a cluster of buildings at East Side, Spottiswoode, comprising an occupied 20th century cottage and outbuilding associated with two ruinous structures, one of which appeared on the basis of wall thickness to be a potential early structure, possibly a bastle. However, excavation revealed it to be a 19th century cottage building with partially-mosaiced porch floor and stone & brick fireplace in the west gable end. An adjacent ruin adjoining the roofed bothy was of similar age, but of more substantial construction with dressed sandstone door jambs and a larger fireplace. A few observations can be made on the basis of site visits with regard to the above fording points, and fords in general. First, the sites of most of them are known, or can be inferred from topographical features, local tradition or place-name evidence, or are indicated by roads approaching the river from both sides, even where the river appears to have changed course within its flood plain, as at Birgham-Carham. Many are in the positions of later salmon netting stations, or shiels, since the shallow water conditions are often formed by rocky outcrops either side of pools, which hold the salmon. For the same reason, however, the fords are also liable to develop into shoals, or islands, meaning that several of them, such as at Graydon near Twizel, are now partially or wholly obscured. Another observation made during site visits, conducted with Trevor Swan and others with detailed knowledge of the river, is that the position of fords is defined as much by access to and from the river bank as by the shallowness of the river. For large parts of its lower course the Tweed has incised deeply into the sedimentary rock and overlying glacial till strata, creating river cliffs which prevent access to the river. Since bends in the river tend to contain streams of faster flowing, deeper water, fords tend to be placed on straight sections of river adjacent to haughs, but some may start at the beginning or end of a bend, taking a diagonal course across the river, much like artificiallyconstructed weirs above mills. In some cases, as at Graydon on the south side of the Tweed, it is possible to see the remains of holloways leading from the ford to higher ground, but where such features have survived they have done so mainly due to the presence of active fishing shiels, all of which have now ceased to operate. With regard to the 16th century fords listed by Bowes and Ellerker, close examination of map evidence combined with field observations suggests that, while most of the 31 named fords can be traced, it is easier to identify locations below Coldstream than above it. This seems to be due to the greater tendency of the river to create islands, as at Wark, and to meander, as at Carham and Coldstream, thereby altering or destroying fords.4 There is a particularly high concentration of fords near Wark, specifically between Cornhill-Coldstream and Wark-Fireburn Mill, but it is unclear whether this is a factor of the increased traffic associated with the commercial and social pull of Wark and Coldstream or simply that more natural crossing points present themselves on this relatively straight section of the Tweed. Conversely, there are relatively few fords close to Berwick, but this may be explained by the presence of a bridge there from medieval times, and by the deepening of the stream towards its mouth. In any case, fording points close to Berwick would not have been exploited by the Scottish army in advance of the Flodden campaign because of exposure to attack and unreliable tides; even the fords above Horncliffe become flooded and impassable during normal high tides, rendering them useless for the passage of a large army which may require several hours to cross and would not want to be constrained by tide times. In addition to the Carham and Fireburn Mill fords giving access to Wark, the Graydon-Twizel ford appears likely to have been particularly important since it gives access to Twizel Bridge over the river Till, which is the only serious impediment to travel along the south side of the Tweed between Kelso and Berwick. It is recorded that the Scottish Army camped at Twizel Castle above the Bridge prior to the Flodden campaign and it is not unreasonable to suggest, therefore, that Graydon Ford was one of the more significant (perhaps the main) fording points used in 1513. That being the case, it may be suggested that the route taken by the bulk of the army from Duns was via Simprim to Twizel. In order to take Norham it would have been possible either to send a subsidiary force from Simiprim to Ladykirk via Upsettlington, or from Twizel along the south bank of the Tweed to approach Norham from the west. Wark could also have been approached from Duns via Simprim and Lennel-Coldstream, with the option of laying siege from the north side of the river at Fireburn Mill or crossing the river at any one of several fords between Coldstream and Fireburn Mill to lay siege from the south; alternatively, an army approaching from Lauder would have approached Fireburn Mill along the course of the current A697 from Greenlaw. Although few medieval bridges are known to have been present in 1513 and even fewer from that period survive today, their potential importance in facilitating the passage of the Scottish army cannot be over-stated. In the north, on the main route from Edinburgh, Haddington Abbey Bridge is an early 16th century three-arched structure while a mile to the west another medieval bridge, Old Nungate Bridge, also carried a main route into Scotland - although the present threearched structure is a mid-16th century replacement of earlier medieval bridges. Lauder Bridge is also suspected as an early crossing of the Leader, potentially providing access to a direct route from Lauder to the Tweed at Coldstream, via Greenlaw, and is mentioned in connection with events associated with a muster in 1482. Finally, in addition to Berwick, inaccessible to James IV in 1513, where a series of wooden bridges were variously destroyed by flooding and military action prior to construction of the current stone bridge from 1611, a number of medieval bridging points over the Tweed are suggested, notably between Birgham and Carham, but the only one reasonably well-attested is Melrose Bridge at Bridgend, a wooden bridge across the Tweed thought to have been built in or just before 1513 and later used by a Scottish army in October 1523. A bridge at Roxburgh on the lower Teviot close to its confluence with the Tweed may have provided access along the south side of the Tweed to a Scottish army crossing the Tweed at Melrose- Bridgend. With regard to the wider road system likely to have been used in the early 16th century, Roy’s mid-18th century survey of Scottish roads was used as a starting point in an attempt to enhance the results of Caldwell’s documentary work (this publication) because, apart from being the only map to focus specifically on roads, it is the last and most detailed map of Scotland produced prior to the redevelopment of the roads network with the widespread introduction of turnpikes and modern bridges from the 1760s, associated with agricultural reforms which included large-scale drainage works from the 1730s and the enclosure of previously open field systems and moorland. Although likely to be accurate in many respects, however, the focus of Roy’s work in the Highlands tended to detract from the level of detail he included in the Lowlands, thereby minimising the number of roads shown there, so it cannot be assumed that a road did not exist because Roy did not include it on his map. That said, Roy’s map is considered likely to give a reasonable impression of the main routes used in the period before major land drainage and other civil engineering works altered the character of the landscape and opened up greater possibilities for communication by road. These routes emphasise the point made by Caldwell concerning the relative abundance of alternative routes down the Leader Valley, with routes such as Dere Street, Girthgate and the old road (Malcolm’s Road) making it one of the main arteries of Medieval Scotland. Roy’s map clearly shows that the current Southern Upland Way was one of the main 18th century routes and likely to have been in use earlier. Field visits to Blainslie on the west side of the valley,5 through which at least two of these routes pass, failed to identify any particular features although it did suggest that these routes traverse reasonably even ground. The Edinburgh-Stow route has not previously been suggested as a potential route from Edinburgh, but seems to offer a reasonable alternative to the Leader Valley routes. The presence of this route on Roy’s map adds credence to the possibility that artillery could have been transported along the south side of the Tweed – assuming a crossing of the Teviot at Roxburgh – after crossing the Tweed at Bridgend, west of Melrose. A crossing point is not shown here – and a site visit did not suggest it as an ideal location, with steep bank sides especially on the north side – although the bridge had not long been out of service by the time of Roy’s survey. This road does not take the Whiteadder route, which could have been accessed from Gifford but would presumably have been reached from Garvald if the intention had been to muster at Johnscleugh. The road shown by Roy follows the same course as the current tarmaced road from Whiteadder head to Duns via Longformacus, but this would have been unsuitable for artillery of baggage trains due to its undulating nature as it crosses numerous small streams. Assuming a course from Haddington to Ellem via Garvald and Johnscleugh, the current road may have been followed or those of green lanes either side of the river, with the main impediment being the steep climb from Garvald towards Johnscleugh. An alternative route to Ellem for those not travelling via Johnscleugh would have been along the Dye Water valley from Longformacus. This is the main coastal route, though set somewhat inland, with minor and major branches at various points to access both coastal settlements and the interior. A route is shown curving from the main coastal route south of Dunbar into a tributary of the Whiteadder valley, thence to Ellem. Although unlikely to have been of great consequence militarily, it could have offered a route for men, artillery and provisions southwards from ships docking at the port of Dunbar. A cross-country route of economic importance, probably established in the medieval period but unlikely to have played a significant role in relation to the Flodden campaign. This route suggests how an army heading from Duns, or Fogo, to Coldstream and Wark could have traversed the notoriously boggy Merse prior to the drainage works and Acts of Enclosure which altered the character of the area so much. Interestingly, no corresponding route is shown from Duns to Norham - a road is shown going east towards Berwick but, in the context of James IV’s aspirations, approaches too close to Berwick for safety before joining another road along the north side of the Tweed near the confluence of rivers Blackadder and Tweed. Despite the loss of many to modern transport superstructure and urban development, and notwithstanding the survey work already carried out by RCHMS and others, further work on all of the above road courses might well produce a better understanding of the options available in 1513. Bishop’s recent use of medieval sources to trace possible Roman road courses in northern Britain (Bishop 2014) suggests a possible research synergy while Elliot’s use of dowsing combined with detailed understanding of landscape to identify Roman roads (Elliot 2012 & 2013) is a reminder that alternative strategies for the identification of roads await critical analysis. 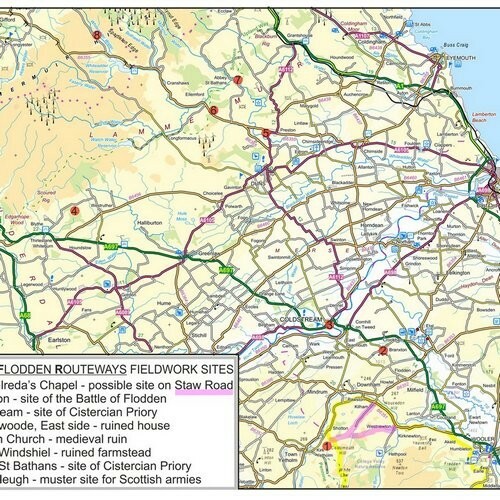 While the precise route, or routes, taken by the Scottish army in 1513 remain elusive, the current research has established a number of likely options and identified considerable scope for additional research, looking for evidence of participation in the Flodden campaign by named individuals, the use of local plans, aerial photographs and maps to plot early roads and routeways of relevance, and even gathering and assessing local traditions which, although suspect in terms of historical veracity, often encapsulate important feelings about 1513. Centred on the Tweed from source to mouth, as well as its tributaries. The work of Tam Ward in the neighbouring Upper Clyde Valley around Biggar, however, suggests that a considerable number of such defensible houses may yet await discovery. Trevor Swan (pers. com.) notes that a rock, formerly in the middle of the stream and used by children less than half a century ago to jump off while swimming, is now located some 30 metres or more into the haugh, emphasising the movement of the river within the haugh south and east of Coldstream. Similar movements are attested at Carham by palaeo-channels in the haugh north of the church. Site of a ‘pele’ known only from a 19th century estate plan in private hands, but viewed during the course of fieldwork in the area. Bishop, M C, 2014, The Secret History of the Roman Roads of Britain. Pen and Sword Military. Caldwell D, 2016, Routes to Flodden, This publication, chapter 20. Cruft K, Dunbar J and R Fawcett, 2006, The Buildings of Scotland: Borders. Yale University Press. Elliot, W, 2012, Divining Archaeology. Selkirk. Elliot, W, 2013, The Devil’s Causeway: The Continuation in Berwickshire. Selkirk. Ryder P F, 2002, Fortified Buildings, in Pevsner N and Richmond I, 2002, The Buildings of England: Northumberland (Second Edition revised by J Grundy, G McCombie, P Ryder and H Welfare). Yale University Press.